New round brings Innoviz's total funding to $214 million, with a second closing of this round expected in the coming months. ROSH HA'AYIN, Israel, March 26, 2019 /PRNewswire/ -- Innoviz Technologies, a leading provider of high-performance, solid-state LiDAR sensors and perception software, announced today that it has raised $132 million in Series C funding. The round is marked by the entrance of new major investors China Merchants Capital (SINO-BLR Industrial Investment Fund, L.P.), Shenzhen Capital Group and New Alliance Capital; and Israeli institutional investors Harel Insurance Investments and Financial Services and Phoenix Insurance Company. Given demand from additional investors, the Series C round will remain open for a second closing to be announced in the coming months. Watch a demo of Innoviz's solid-state LiDAR solution on a live test drive in the San Francisco Bay Area. 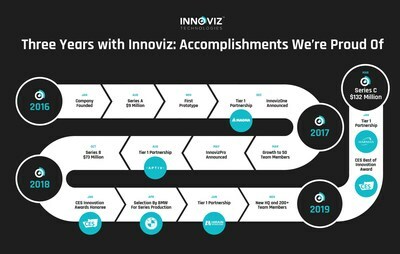 Innoviz’s path to industry leadership includes first-of-its-kind customer wins, strategic partnerships with Tier 1 suppliers, impressive product development timelines, coveted industry accolades and more. The Innoviz Team at the company’s new headquarters in Israel - March 2019. This significant raise will support Innoviz's commercialization of its leading InnovizPro and InnovizOne solid-state LiDAR solutions and address growing demand for cutting-edge autonomous vehicles (AV) technologies worldwide. 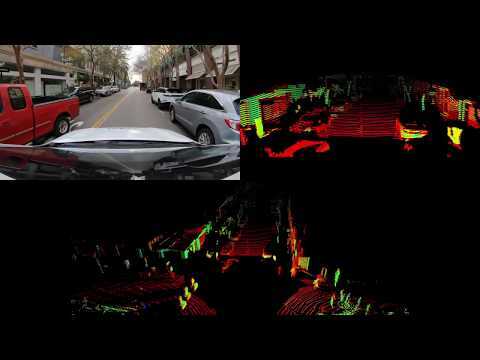 View a live demonstration of Innoviz's solid-state LiDAR solution in action here. The company is focusing expansion efforts in key automotive markets including the U.S., Europe, Japan and China. Innoviz also plans to expand its research and development efforts by investing in the buildout of next-generation products and software that will feature more cost reductions and improved performance. "We've experienced significant growth over the past year to meet increased demand for solid-state LiDAR. This fundraising enables many of the substantial commitments it takes to bring this technology to market at a massive scale — the scale required by Tier 1 suppliers and automakers leveraging LiDAR to deliver autonomous vehicles to the masses by 2021. We're excited to transition our production, manufacturing and research and development efforts into the next phase and continue to furnish the full stack of LiDAR hardware and software solutions to the industry," said Omer Keilaf, CEO and co-founder of Innoviz. "This round is a strong testament to the excellent progress we've made in cementing our technology as a true market leader capable of meeting the rigorous automotive standards at a cost that makes mass production realistic." Innoviz's perception software coupled with its advanced LiDAR technology creates a holistic hardware and software stack that turns LiDAR data into an indispensable input for autonomous driving. Rather than focusing on bringing quick solutions to the market, Innoviz has chosen an ambitious path of developing a product and perception software through partnerships with original equipment manufacturers (OEMs) and Tier 1 suppliers, including Magna, HARMAN, HiRain Technologies and Aptiv, to assure full compliance with the highest automotive-grade production standards. "Among the dozens of LiDAR startups that have popped up in recent years, only a small handful have progressed far enough and demonstrated the capability to get to volume production and be selected for new vehicle programs including Innoviz," said Sam Abuelsamid, Navigant Research Principal Analyst, Mobility. "Sensor companies that can develop partnerships with established automotive suppliers that understand the integration, validation and production requirements to ensure automotive levels of product reliability and safety will also have an advantage in achieving scale." A partnership with Magna International, which also participated in the round, resulted in Innoviz's automotive-grade LiDAR, InnovizOne, and its computer vision software being selected by BMW for series production of vehicles starting in 2021 – an industry-first design win for solid-state LiDAR that was instrumental in defining a path for LiDAR to enter the automotive industry. Innoviz's new funding will assist in bringing this program, as well as additional automotive OEM design wins, to production at scale, as well as provide overall support for the expected company growth. Innoviz recently significantly expanded its international presence in key automaker markets including Germany, North America, Japan and China. Innoviz's expanded presence in China coupled with investments from China Merchants Capital and Shenzhen Capital Group and Innoviz's existing partnership with HiRain Technologies, one of the most influential companies in the Chinese automotive industry, further solidifies Innoviz's presence in the country, which has notable AV efforts underway and an automotive industry that rivals the rest of the world. The company will also ramp up production to meet demand for InnovizPro, its commercially available solid-state LiDAR that offers outstanding performance and value for automotive, mapping and other applications. Goldman Sachs served as sole placement agent in this round. Innoviz is a leading manufacturer of high-performance, solid-state LiDAR sensors and perception software that enable the mass-production of autonomous vehicles. InnovizPro is a solid-state LiDAR that offers outstanding performance and value for automotive and other applications. InnovizOne is a cutting-edge, automotive-grade LiDAR sensor that provides superior 3D sensing for Level 3-Level 5 autonomous driving. Innoviz is backed by top-tier strategic partners and investors, including Magna International, Samsung, Aptiv, Magma Venture Partners, Vertex Ventures, SoftBank Ventures Asia, 360 Capital Partners, Glory Ventures, Naver, China Merchants Capital (SINO-BLR Industrial Investment Fund, L.P.), Shenzhen Capital Group, New Alliance Capital, Harel Insurance Investments and Financial Services, Phoenix Insurance Company and others. For more information, visit www.innoviz.tech.